I’m grateful to Mathias Corvinus College here in Budapest, represented this morning by vice-rector Zoltán Szántó and MCC managing director Zoltán Szalai, for publishing the Hungarian translation of Redeeming Economics: Rediscovering the Missing Element. I’m grateful also to the high-powered panel whose members agreed to discuss the book and its themes this morning: moderator Ἀkos Gergely Balogh, and panelists András Lánczi, Ferenc Horkay, János Csák, Laszló Csaba, and Karoly Mike. Let me briefly outline its content, and then explain how I came to write the book. Adam Smith, the father of modern (classical) economics, dropped two of the four equations, those for consumption and distribution. With neoclassical economics the equation for consumption was restored. But neoclassical theory has nothing to say about distribution, leaving the restoration of economics incomplete. Mueller sees this reconstruction (redemption) continuing with his book, with the efforts of other nascent neo-Scholastics and, he predicts, eventually by the profession at large. Thus Mueller himself does not think his book will be ignored. Or perhaps, if it is ignored the deficiency of economics will become evident to practitioners from their experiences doing economics. Mueller expects that economists will find their way to a neo-Scholastic economics that will preserve the best of both Smith and the neoclassicals, while restoring the theory of distribution. But in terms that most ordinary people can understand, the scholastic, classical, and neoclassical systems presuppose three different views of human and divine nature, differing on whether man and God have free will. In part, I contrast what Nobel economics laureates George J. Stigler and Gary S. Becker of the University of Chicago called the “economic approach to human behavior” with the “human approach to economic behavior” presupposed by (neo-) scholastic economics. I use the term “redeem” in the sense of “fulfill (an earlier promise or pledge).” If, as I believe, the next phase in economics is Neoscholastic, it will have fulfilled its original promise. 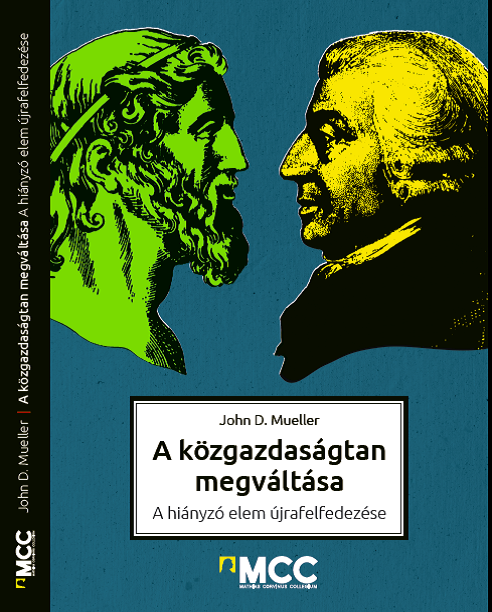 I’m especially grateful to my friend János Csák–a real Renaissance man–for translating Redeeming Economics into Hungarian, together with Zoltan Abraham. Janos asked me to describe briefly how I came to write the book. I suppose it was the accident of my recovering from college atheism while becoming an economic forecaster. I had first read the “AAA’s” — Aristotle, Augustine, and Aquinas — in high school and college. But I had to return to them as I realized that my atheism was logically untenable. That was mostly while I worked for then-Congressman Jack Kemp, as he persuaded President Ronald Reagan to adopt his economic ideas (and incidentally giving me free run of the Library of Congress). Redeeming Economics presumes only the natural law: what we can know by reasoning from common experience. Though comprising the largest single religious denomination, Roman Catholics make up less than one quarter of the U.S. population. But as I will note later this week at a conference co-sponsored by KETEG (Christian Social Principles in Economy), (neo-) scholastic economics also provides the analytical “toolkit” necessary to understand and explain Catholic social doctrine. HAMMOND, Daniel J. Review of Redeeming Economics: Rediscovering the Missing Element. by John D. Mueller. Faith & Economics 59 (Spring 2012) 73-77. Click here to purchase a copy of the English-language version of Redeeming Economics.